When it comes to the health of your children’s teeth, the old adage “ounce of prevention is worth a pound of cure” couldn’t be more true. Maintaining a healthy smile for a lifetime is possible with consistent care from a dentist and at-home hygiene. However, this can be a difficult routine for many patients to maintain, especially young children. At The Tooth Station, we offer preventive dental care for children in Folsom and are committed to equipping patients with the education they need to enjoy strong smiles as they grow. As an adult, you understand how important it is to brush and floss your teeth each day. Children typically don’t prioritize their oral health, which is where your role as a parent becomes vital for their wellness. Our pediatric dentist, Dr. Bryan Randolph, gives patients and their families all of the help and assistance they need to create and maintain healthy at-home habits. We coach parents and children on how to brush, by using a pea-sized amount of toothpaste and a soft-bristled toothbrush. Using gentle, circular motions, and holding a brush at a 45-degree angle, sweep the bristles over your child’s teeth. If they need help, guide them by carefully holding their hands and demonstrating how you brush your teeth yourself. 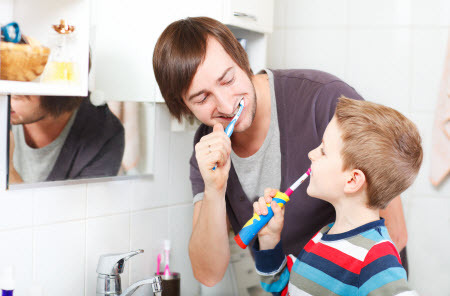 If kids are uninterested in hygiene routines, we recommend letting them pick out their own toothbrushes, such as one that plays music or features their favorite TV and movie characters. The other component to healthy smiles is biannual visits with the dentist. This allows Dr. Bryan to monitor your child’s dental health and ensures there are no signs of decay present on their teeth. Keeping these routine appointments is highly important; during check-ups, Dr. Bryan and his team provide thorough dental cleanings and examinations, both of which are necessary for preserving wellness and preventing the accumulation of cavity-causing debris and bacteria. Visit the Tooth Station for Healthy Smiles! Our Folsom pediatric dentist, Dr. Bryan Randolph, and his team invite you and your children into our friendly dental office for comprehensive care. It is our mission to ensure your child receives the attention they need.